ALBANY — The Saturday afternoon Mass at St. Catherine of Siena draws 400 people. The confession period beforehand draws two. The second makes it just before closing time. It’s been about three months since Mariam O’Brien’s last confession, and a few days since she skipped Mass. The 84-year-old shuts the door and enters a soothing room with a red carpet, a box of tissues and a priest, the Rev. Kenneth Doyle, who confesses that hearing confessions is one of his favorite duties. She steps out minutes later. This scene in Albany speaks volumes about the state of confession in America. The sacrament, once a pillar of Catholic practice, is crumbling. And the way people confess, both what they say and where they say it, is shifting from the old laundry lists of minor misdeeds recited in austere anonymous boxes. Only 26 percent of Catholics go to confession at least once a year, according to a 2005 poll by Georgetown University’s Center for Applied Research in the Apostolate. A University of Notre Dame study in the early 1980s put the number at 74 percent. It’s an alarming trend for Catholic leaders, who see confession as essential to spiritual health. What’s at stake is a route, laid out in the Bible, to examine your conscience, overcome sin and achieve grace. And earlier this year, the Washington Archdiocese tried to lure folks back to confession with a marketing campaign – catch phrase: “The Light Is On For You” – that slapped ads on buses and subway cars, and passed out how-to guides and wallet-size contrition cards. Confession has become so foreign to so many Catholics that priests like Doyle keep sample acts of contrition on hand so sinners can read aloud words they once would have known by heart. Doyle, also 67, remembers how it used to be when he and his buddies biked to Sacred Heart Church on Saturdays as kids in Troy. The dark box. The screened-off priest. The second-grader’s fear of that first confession. The Vatican approved this style in the 1970s. The idea was that worshippers, abandoning confession in droves, would find such sessions more meaningful. “That option certainly didn’t bring the large numbers back,” said James O’Toole, a history professor at Boston College who studies confession. An emerging confession style that is attracting interest – and the scorn of Catholic leaders – replaces the whisper of priests with the click-clack of computer keys. Protestant churches and secular groups have created Web sites that let users anonymously cyber-dish their confessions to the world. Nothing like the G-rated fare that Doyle, who doubles as chancellor for public information of the Albany Diocese, typically hears in his confessional. Those Catholics who still confess regularly “tend to be the ones who are most faithful to their obligations,” he said. So parishioners fess up to not praying enough or not being thankful enough for their blessings. Husbands regret failing to be understanding enough of wives. Parents lament not being patient enough with their kids. “It’s not very often that I meet some people that come in and say, `I killed the guy next door,’ ” Doyle said. You probably won’t find any murderers coming clean on confession Web sites like the evangelical service http://www.mysecret.tv. But you will find a husband who leads a double life of secret gay hookups. A man disgusted by his addiction to masturbation. A recovering drug addict who molested his little brother. These Web sites are a new phenomenon. So why, to borrow O’Toole’s phrase, has Catholic confession “fallen through the floor”? Ask Doyle the same question, and he points to one primary explanation: a diminishing sense of sin. He feels our society chalks up misbehavior to psychological factors. Or socioeconomic influences. Or family upbringing. O’Toole also pointed to a new emphasis since the 1960s on the social dimensions of sin, the notion that sin isn’t so much “I punched my sister” as it is things like racism, sexism and damaging the environment. Stuff that’s generally harder to talk about in the confessional. The professor added that rates of Communion skyrocketed after Vatican II in the 1960s, while rates of confession plummeted. Catholics, he said, got the idea that the Eucharist itself provided forgiveness. For minor sins, Doyle said, that’s true. All of that is much more complicated than the simple reason one parishioner offered for why she prays every night but hasn’t confessed in at least 15 years. For those who do, the old ways live on at St. Mary’s Church, incorporated in 1796 and the state’s second-oldest Catholic parish. It doesn’t get more traditional than these confessionals: the lacquered wood, the mustard-yellow curtains, the complete anonymity behind them. 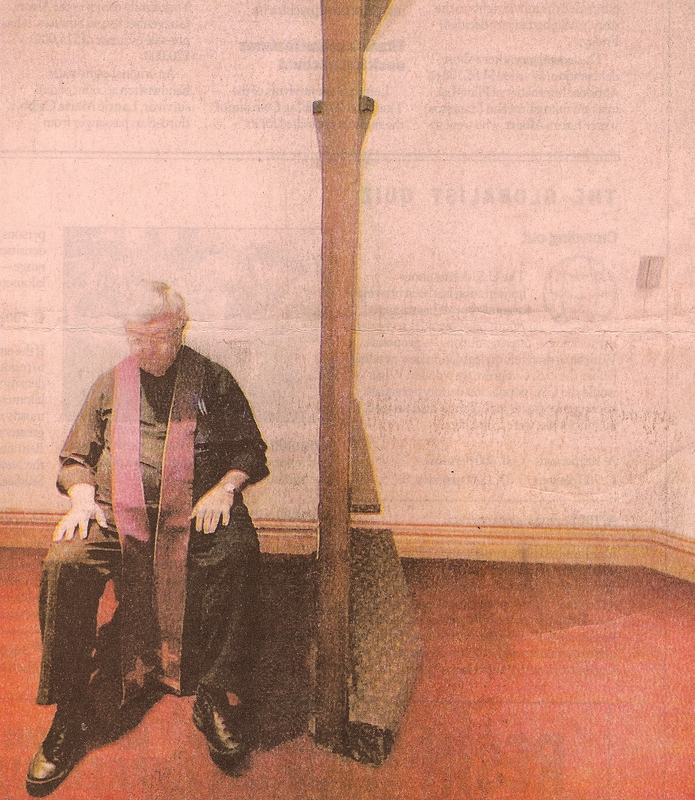 And for parishioners like Ruth, who gave her age as “over 80,” this is how confession should be. You remove the anonymity, she said, and “too much personality” gets involved. And doesn’t looking at a priest change what you’re willing to tell him? “They teach the kids now to go face to face,” said Ruth, of Colonie, who did not want her last name published. “I prefer the way I have always gone, behind the screen.” For a newer twist, visit the commercial hub of Colonie’s Wolf Road, where if you didn’t read the sign you might mistake St. Francis Chapel for the nearby tanning salon. 1. Make it available where the people are. 2. Be there for them all day. Instead of just Saturday afternoons or by appointment, the friars are there for you weekdays, too. They split the day into shifts that end at 7:30 p.m. This lets them hear an astounding volume of confessions by today’s standards – up to 50 a day. They don’t even have to wait in the box for penitents. Every time one enters the confessional, it triggers a sensor that rings a bell in the church office. This happened repeatedly during an interview with Mudd one recent afternoon. Each time, the brown-robed friar excused himself and slipped into the confessional through a back door. A few minutes from St. Francis, but worlds away theologically, is Lifechurch.tv. You won’t find a confessional there. Most Sundays, you won’t even hear a live sermon. The tennis-bubble-like dome off Sand Creek Road is the “Albany campus” of an Oklahoma-based network of evangelical churches. Lifechurch beams the sermons of its senior pastor to screens at its far-flung member campuses. Lifechurch launched the confession Web site http://www.mysecret.tv. Its users include Albany worship pastor Joe Dingwall, who was online in the church’s dartboard-equipped office one day when others’ confessions motivated him to post his own. That we’re-all-going-through-the-same-thing camaraderie is why Dingwall, 26, prefers sharing his sins online to airing them in a Catholic confessional, something he has tried despite not being Catholic. Catholic authorities have condemned online confessionals. The Vatican advised bishops and priests not to use them three years ago, the reason being that “ill-intentioned people such as hackers” might read the confessions and use them for nefarious purposes like blackmail. So is there any bright spot in the Catholic confession landscape? Yes. Several Catholic priests agreed that the few people who still use the sacrament are using it really well. Today’s penitents are far more likely to talk about “sins of omission,” as Doyle put it. People might lament their failures to put in enough effort at work, say, or to be generous with their money or time. The Rev. Paul Smith, sacramental minister at churches in Altamont and Berne, said parishioners now delve into things like bigotry – into the attitudes that underlie their misbehavior. “They’re willing to go deeper,” he said.